In drawing attention to the urgency of addressing global warming during his acceptance speech, Oscar-winner Leonardo DiCaprio drew many cheers. He also drew a few rolled eyes in western Canada. The film shoot for The Revenant did, as DiCaprio implied in his speech, actually relocate from Alberta due to a rapid change in weather and a lack of snow. The weather, though, was not much of a surprise to Albertans, or to any people who live on the leeward, inland side of a large mountain range. It was an old-fashioned chinook caused by the difference in the rates that wet and dry air change temperature when forced to rise or fall over a mountain range. The same phenomenon is called a Wuhan in China, a Foehn in parts of Europe, and a Lyvas in Greece. Naturally, DiCaprio’s speech pushed some buttons. In scrutinizing DiCaprio’s claim, let’s not forget to see the forest – the climate – for the trees – the weather. Last year absolutely whupped temperature records both globally, and in much of western Canada. That was not your grandparents’ chinook: Calgary hit over 17°C, 4°C more than the previous record. Temperature records were set that month on both sides of the Rockies. 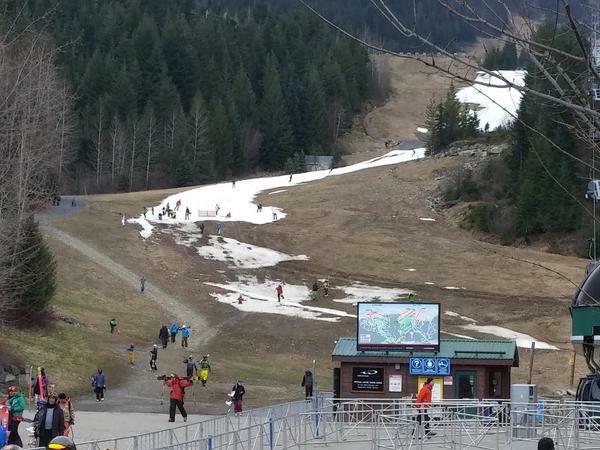 Snow depths hit record lows in parts of British Columbia. Ski areas struggled to stay open, or to keep enough snow to get to the bottom, as in this photo from Whistler, BC in early March. DiCaprio’s speech about scouring the planet to find snow was broadly correct. Winters are getting shorter. It is getting harde r to find snow, particularly in late winter and spring. Since the late 1960s, Northern hemisphere snow cover has decreased 1.6% per decade in March and April and 12% (!) per decade (!) in June, according to the last IPCC report. Snow cover is expected to continue to decline for decades into the future, especially if we continue doing business as usual. 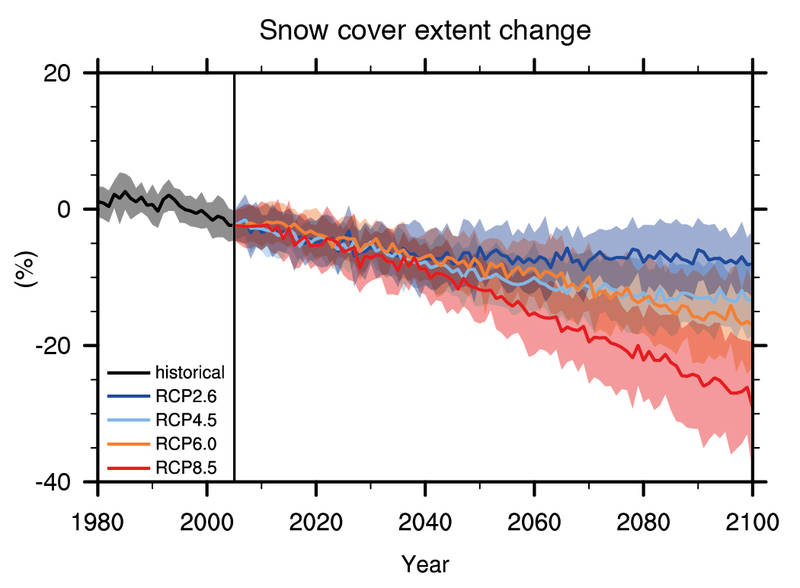 The graph shows the projected decline in March and April snow cover across the Northern Hemisphere under a variety of different climate scenarios, from the last IPCC report (the red scenario is roughly “business is usual”). Leonardo DiCaprio’s example may not have been ideal. He may need to read up on adiabatic warming and cooling. Nevertheless, the planet is and has been getting less white.